I glanced through the MMST pit hangars to check if all the OVERDRIVE awards nominee cars were in place, and the field appeared more or less adequate. My eyes roamed over the bonnets, and in one far corner I saw the white and chrome of a Volkswagen. I dismissed it as another variant of the Ameo. Volkswagen had sent three variants of that sedan, and I simply assumed this was one more of that trio. Then the sun filtering through the rafters bounced off the chrome on the VW badge on the front grille, and caught the red streak under it. I knew no Ameo had red in its face, and a closer look showed a front bumper with an inverted smile, so Volkswagen had sent the Polo GTI after all! Today was going to be an interesting day. The Volkswagen Polo GTI, for those who aren't aware of what it is, is the sportiest version of the Polo hatchback. Apart from the name, however, this car shares very little with the standard Polo. The chassis is common to both of course, but beyond that everything is of a superior grade. The engine is a larger displacement 4-cylinder, the suspension is stiffer, the brakes larger and the steering more precise. And it costs upwards of Rs 26 lakh in India, whereas the basic Polo retails at an average of around Rs 10 lakh. The Polo GTI, it's the equivalent of a hare being chased by a hunting dog, superfast and super slick! The last time we got our hands on this car, we pit it against the Mini Cooper, and it turned out to be a winner. Now it's at a racetrack; we've brought Armaan Ebrahim as a juror, so in between testing the nominated cars, we get him to throw in a few laps. When he gets back, he's gone through half a tank of fuel, and the on-board fuel meter shows a range of 20km. That's roughly four laps on a 3.7km circuit. One out, two hot and one in! Right, let's get on with it then, make the most of the petrol fumes we have left. this is a car where you just have to 'stick to the plan'. Under the Polo GTI's hood is a simple inline 4-pot mill. No fancy stuff there, except it is directly fed through a high-pressure injection system and a fairly big turbocharger. Peak power output is a 192PS. Good enough now to get your juices running? Easing out of the pit lane and sticking to the 60kmph pit speed limit, the GTI does not feel extraordinary. Bear in mind this is still a 4-cylinder engine, also meant to ferry people efficiently and comfortably. But get across the pit lane boundary marker and floor the pedal. There's a thin but sufficiently audible turbo whistle as the engine generates 250Nm of shove and the needle starts zipping past the analogue digits! This engine is used to power larger cars like the Superb and Octavia in a lower-powered spec. Here, the drivetrain generates 151PS per tonne which is impressive if you want straight-line performance. Right out of the pits though it's not easy to gauge grunt because a sharp 90 degree right-hander comes up pretty quick. Quick dab on the brake pedal, sharp turn in and the Polo GTI simply breezes through that first corner. 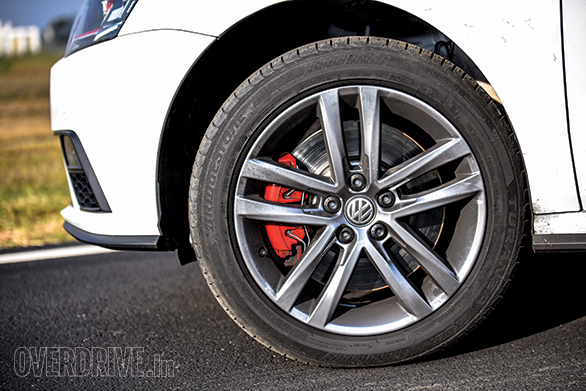 The GTI has got a slightly larger and better braking system than the standard Polo which uses drums at the rear. This gets 310mm ventilated discs at the front and 230mm solid discs at the rear. Plus they have had some time to cool down in the pits after Armaan's lap. So they bite well, hard and fast and give you enough confidence to keep the front and rear end pinned to the track. That sort of composure comes by way of the stiffened chassis and suspension and a better steering system with more precision and balance. 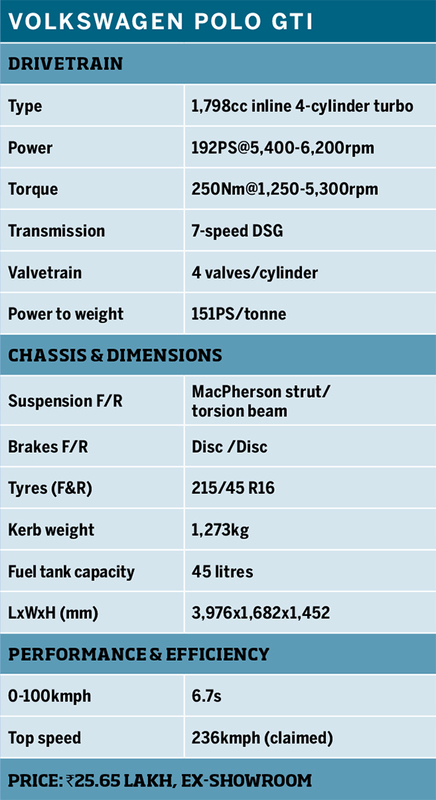 The general layout of the suspension is still the same as the standard Polo, but it uses stiffer rated springs. Now here is the catch, the India-spec car has got some suspension tweaks to make it adapt to our conditions. 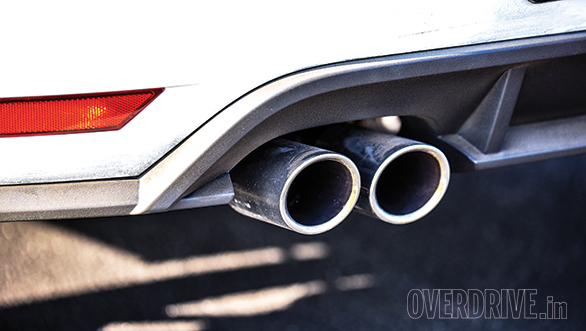 And by that Volkswagen means fat cats who buy this car won't find the stiff ride offered by the original suspension configuration to their liking. So Volkswagen India decided to dilute the feel of this car. Nonetheless, they haven't managed to mess it up too much  a thicker anti-roll bar and revised front anti-roll bar linkages and torsion beam bushings ensure the car still stays neutral while cornering. Toss the GTI into the corners and the Bridgestone Turanzas, which are fairly performance-biased tyres but not outright sporty, squeal a bit but still hold a respectable line. You can sense the front wanting to understeer, but this is where the XDS+ electronic front differential lock comes into play, keeping traction in check and reducing understeer. 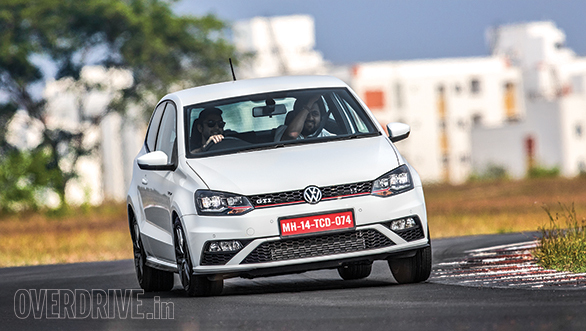 Another area where Volkswagen India deemed it necessary to muck around with was the ground clearance. 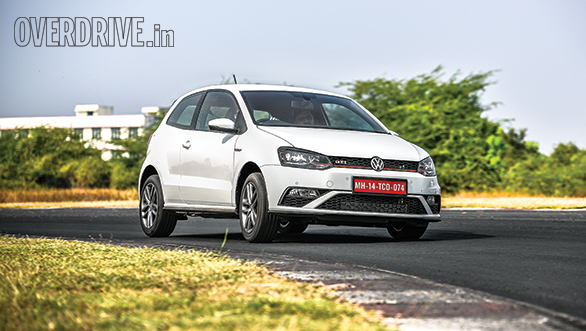 World over, the Polo GTI sits 15mm lower than the India-spec version, which has 155mm of ground clearance. Still, it's not a deal-breaker and if you truly wanted to buy this car for serious track use, we'd suggest replacing the tyres, lowering the suspension and getting more supportive seats for a start. You'd then be much closer to a superlative track hatch! Still the GTI is keeping up a brave face as I push her quicker and quicker through the corners. I don't have the same pace, precision and skills as Armaan but I can hold my own. And the GTI is getting hustled for all its worth. At Rs 26 lakh ex-showroom, this car had better be astounding. I'm now past the major corners at the Chennai racetrack. It's just the last three corners I need to stitch together before I hit the front straight. I blaze past the right-hand kink leading up to C10, an acute left-hander, the front's scrabbling for grip as the tail lightens up ever so gently unsettling the weight balance of the car. There's a hint of lift-off oversteer, but you use it to position yourself for the oncoming corner. You can sense the rubber band effect building up, and as I hit the brakes, turn left, the GTI comes around. The tail is now completely sideways. I let the slide carry me through the corner, simply adding a bit of throttle and steering to keep it dancing on the edge. Then it's time to hit the brakes again, apex through the right-hand corner, and it's up the gearbox. I've dropped a gear on the 7-speed DSG to fifth, in anticipation of the hill. 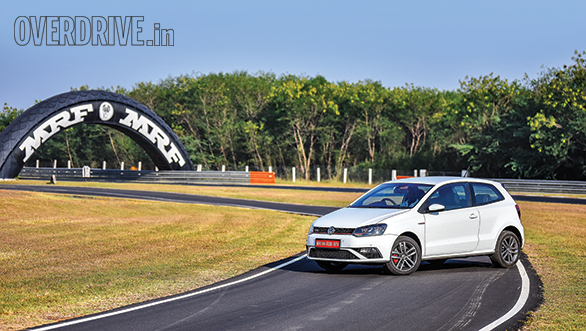 However, the 250Nm of torque is just not enough to carry the GTI through at a brisk pace. So it's down one more gear to get into the powerband. The Polo GTI has a strong mid-range but a weak top end means once I'm past C12, it takes an age to get the car to its claimed 235kmph top speed. This 1.8-litre engine is a heavily reworked EA888 unit, originally designed by Audi. The massive reworking involves a water-cooled integrated exhaust manifold, thinner crankcase walls, lightweight internals, positive crankcase ventilation, variable valve timing with two-stage variable lift camshaft adjustment, sintered cam lobes etc. This third-generation EA888 engine is a bit lighter than its predecessor, but overall the Polo GTI has added weight, nearly 83 kilos more than before. It's remarkably responsive once you are in your stride, but yes it could have been more energetic and linear. So, on the main straight you barely see a 150kmph before you run out of room and cojones. Dial back the throttle a slight margin to let the GTI settle into the undulating sweeping right-hander, and it's back to the drill again. 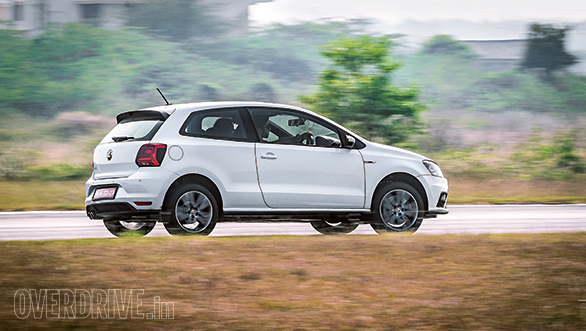 The Polo GTI is a fabulous hatchback, also because there is so much more potential to be unleashed in it. 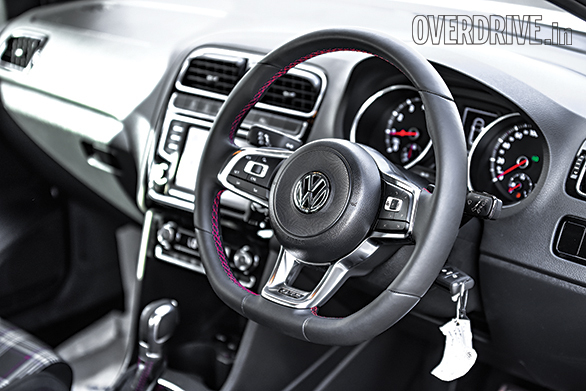 It's a smashing car that's got the practicality bit covered in fair measure, but also lets you exploit the performance envelope of the GTI brand in ways you never expected a Volkswagen to do!